Back from the CHA Show! Back from the CHA show (Craft & Hobby Association) in Anaheim! 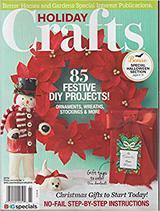 It was a busy week beginning with the two day consumer Craft Supershow. The highlight of the consumer show was the Inspired at Home PJ party Friday evening. I felt like Vanna White as I got to carry Tiffany Windsor's laptop around while she and Maria Nerius broadcast to the Facebook fans. The 100 participants in the PJ party had so much fun crafting and winning all kinds of door prizes. Each table got to try a different craft from sponsors such as Walnut Hollow, Beacon and Plaid. Aleene was there as well with her daughters Tiffany and Heidi, it was a great evening and Tiffany made all of the volunteers a beautiful momento necklace. She is such a lovely person and I thoroughly enjoyed the event and the creative energy was sparked with fluffy robes and a variety of bunny, turtle and monster slippers! 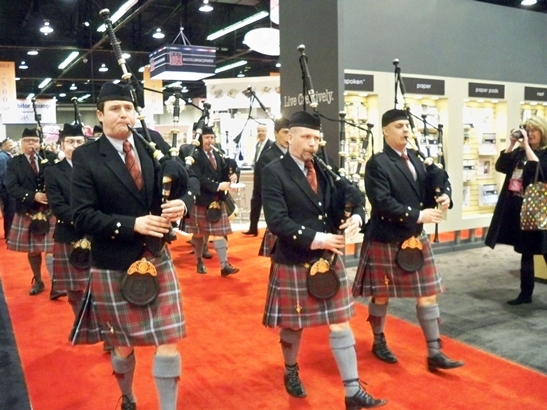 The tradeshow opened on Sunday with the bagpipers which always begins the show with an exciting energy. Carla Schauer and I exhibited in the L&D (License and Design) section of the tradeshow. 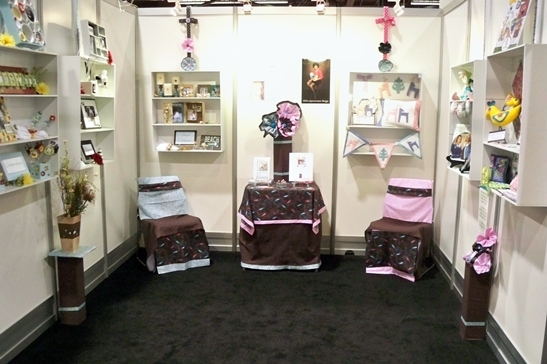 Her Dad built amazing folding shelves which were perfect for the booth and I added the fabric accents. The majority of the exhibitors in this section have flat art but there were several designers exhibiting as well. It is an opportunity to meet with Art Directors flown in from the gift and home decor industries and manufacturers at the show usually visit this section on the last day of the show. The L&D section grew this year but the show itself was smaller due to the effects of the economy. The Craft Supershow before the tradeshow with the thousands of consumers who did attend showed though the enthusiasm that people have for crafting. Creativity is now well established as being instrumental for our health and well being. Celebrate Creativity! More from the show this week! Always Follow the JOY! 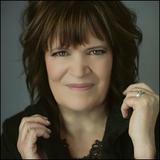 Debra Quartermain, CEO!